Toyota Land Cruiser pick-up Truck is our best selling pick-up truck and best selling Toyota Land Cruiser model from Jim Autos Dubai in LHD. 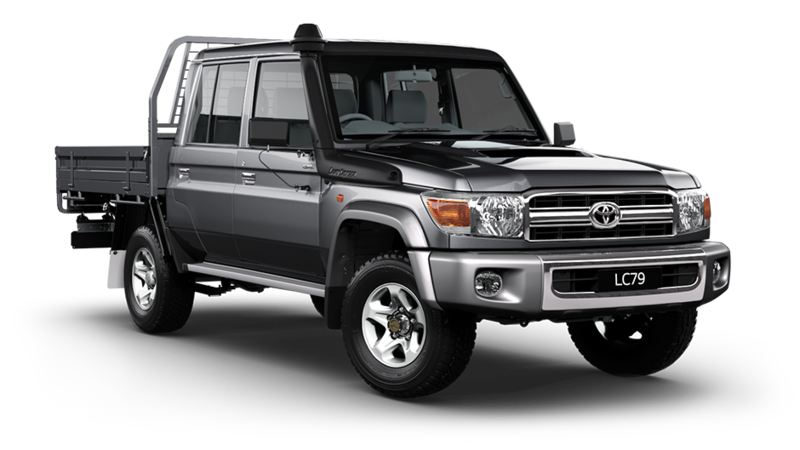 Landcruiser pick-up LC79 is also available in Right Hand Drive RHD at Jim Autos New Zealand and Jim Autos Australia. LC79 in Australia is available in Single Cab in Workmate, GX and GXL models and in Double Cab in Wokmate and GXL all Manual transmission. In New Zealand Land Cruiser 79 is a VDJ-79R model and is available as Base Cab and Chassis and high-end LX Cab and Chassis. NZ LC can be further enhanced with HCP Package. Both model are manual transmission. In Dubai Left Hand Drive LC79 is a HZJ-79 model with 4200 cc engine while Oceania models are 4500 cc. Driving beyond all expectations, from desert heat to the South Pole, in the most severe off-road conditions, Land Cruiser has earned its title as king of 4WDs, its performance and reliability legendary. It began in Japan in 1951 with the tough Toyota BJ prototype. The name Land Cruiser was adopted in 1954 and the following year saw the 20 series, whose ruggedness drove export sales. In the 1960s, the 40 series models made Land Cruiser’s reputation unassailable. An F-type engine and other enhancements dramatically improved high speed and off road performance. Land Cruiser became renowned for utility wherever it was driven and today’s models are heirs to the legendary 40 series, demonstrating the same strengths, durability, reliability and endurance, with added comfort and superior handling making it the number one choice of utility vehicle. Today, Land Cruiser’s superior functionality comes as standard, along with exciting, sophisticated design features; with the new Land Cruiser 70s, a new legend is born. II. Toyota Landcruiser pick-up LHD RHD Comfort: It has never been easier to sit back, relax and focus on your driving. Put yourselves in the driver’s seat. The stylish instrument panel is fine tuned for this Land Cruiser, with high quality in every detail, the hazard switch and clock at the largest and all other controls within easy reach.